The South China Morning Post, citing Reuters statistics, reported on Monday that China has reduced its trade with North Korea by over 50 percent in the past year, potentially crippling Pyongyang’s economy given that China is North Korea’s largest trade partner. The newspaper notes that China is believed to be responsible for over 90 percent of North Korea’s international trade, as the nations border each other and share an ideology. The Communist Party of China agreed in the past two years, however, to abide by international, United Nations-led sanctions against Pyongyang in response to the nation’s latest nuclear weapon test, which occurred in September 2017. The Reuters statistics indicate that China has at least nominally abided by the sanctions. According to the Morning Post, the numbers come from Chinese customs data, meaning they document only the trade legally recorded with North Korea. Those numbers show a 33-percent drop in exports to North Korea between January and November 2018, and a nearly 90-percent drop in imports from North Korea to China. The latter number represents an alleged loss of $ 191.75 million in profit for Pyongyang, though China appeared to sell North Korea upwards of $200 million in exports a month this year nonetheless. 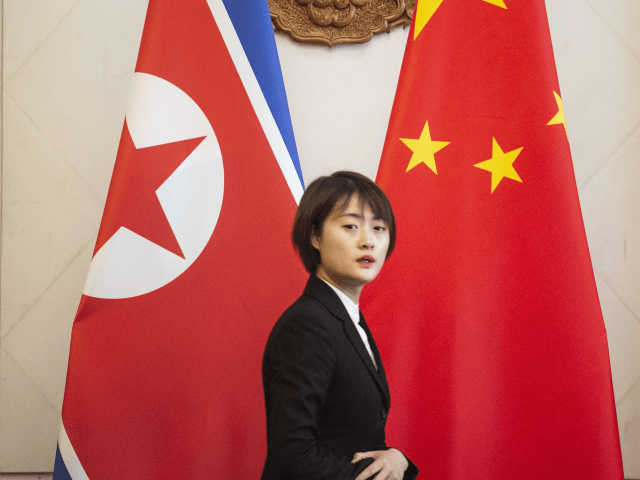 The numbers indicate either that China has truly begun cutting economic ties to North Korea or that Chinese businessmen have become more adept at hiding their trade with North Korea from official government observers. Recent reports highly suggest the latter – that illicit trade with North Korea persists, and may have increased, as official trade with the country diminished. Early this month, Japan’s Nikkei Asian Review reported that the month of November saw a dramatic increase in the number of trucks carrying shipments from North Korea into China even as the official trade volume declined. Nikkei cities local business executives in Dandong, a city on the Yalu River which marks the border between the two countries. “These days, the bridge gets jammed with traffic, which is something we rarely saw after the  sanctions resolution,” the unnamed executive claimed, listing seafood as the primary good entering China from North Korea, which is listed in the U.N. sanctions as one of the main goods the international community is banned from buying from North Korea. Locals say the North Korean seafood, while branded as coming from other parts of China, is clearly of species native to the North, and it is difficult to believe they were imported from too far when North Korea is clearly visible from the other side of the Yalu River. “Black North Korean clams are easily distinguished from the yellow Chinese variety, claimed a middle-aged woman at the Donggang Yellow Sea market as she hooked some out of a net and sorted them by size,” Nikkei noted, adding that the publication’s reporter indeed witnessed seafood restaurants primarily serving black clams. In exchange, Nikkei alleges that China is shipping construction materials to North Korea. The executive’s claim that trucks carrying such equipment flooded the border crossing regularly appeared connected to the growing development of construction projects visible from China. Among the goods “smuggled regularly” across the border, according to RFA, are iron and other ore, oil, clothing, and even North Korean art. “North Korean art, too, is openly sold in China, with pieces selling for prices ranging from 3,500 Chinese yuan (U.S. $507) to as much as 10,000 yuan (U.S. $1,451),” RFA reports. China, in addition to being North Korea’s largest trade partner, is the nation’s closest political ally. The Chinese state-run newspaper Global Times published an article Sunday promoting dialogue between North Korea and the United States that could lead to an end to international sanctions, which would likely trigger a legal trade boom between the two communist countries. The Global Times accused the United States, not North Korea, of being intransigent on nuclear weapons talks. “The problem is that the U.S. has set as a prerequisite that North Korea denounce nuclear weapons before any steps are taken, while North Korea wants a peace treaty,” the article claims, suggesting that the administration of President Donald Trump is wrong to demand that North Korea end its illegal nuclear weapons program without first signing a peace treaty on the Korean War. While an armistice agreement ended active hostilities in 1953, the two countries technically remain at war, allowing the U.S. to keep troops stationed on the Korean border. North Korean officials claim that any presence of American troops on the Korean Peninsula is “nuclearizing” the region, and the U.S. must first “de-nuclearized” before North Korea moves to dismantle its illegal weapons program. The Times‘ advice follows the publication of belligerent remarks in North Korean state media insisting that the United States must withdraw its military completely from the Korean peninsula before Pyongyang considers ending its nuclear program. “The United States must now recognize the accurate meaning of the denuclearization of the Korean Peninsula, and especially, must study geography,” the Korean Central News Agency (KCNA) demanded last week. The United States does not currently have any nuclear weapons stationed on the Korean peninsula.